These are the curtains in my home office: cheap white Target panels I decorated with fabric paint. 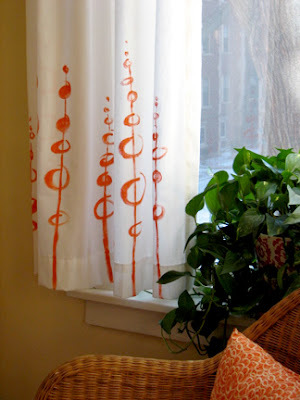 This is an easy way to make yourself some custom curtains you can be sure no one else has. You have read this article decorating / fabric / home with the title February 2007. 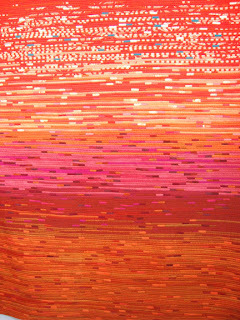 You can bookmark this page URL http://jenkrebs.blogspot.com/2007/02/painted-curtains.html. Thanks! I love these metal cannisters we got at Ikea--a couple bucks for the whole set. Now they hold our coffee: beans and ground. And the big one is for nasty leftover candy from holidays gone by. I'd like to throw it out, but Alex insists on keeping it in case he "needs" it. You have read this article favorite things with the title February 2007. You can bookmark this page URL http://jenkrebs.blogspot.com/2007/02/a-great-deal.html. Thanks! Here's a small painting I did awhile back. You have read this article paintings with the title February 2007. You can bookmark this page URL http://jenkrebs.blogspot.com/2007/02/sitting-around-house.html. Thanks! Here are some of the first paintings I made to fill up the empty walls in our condo. Maybe a year ago? Can't recall. Here they are in their natural habitat. 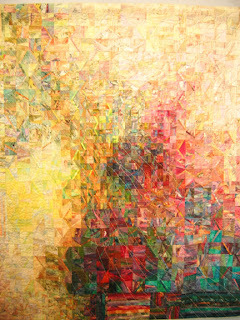 You have read this article home / paintings with the title February 2007. 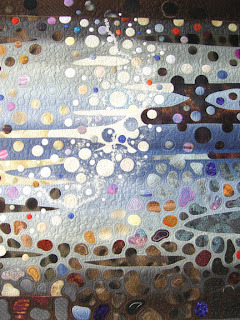 You can bookmark this page URL http://jenkrebs.blogspot.com/2007/02/stripey-twirly-art.html. Thanks! In honor of my wonderful grandma, who turns 85 today, I post this. These little scraps are about 0.0002% of her fabric stash, which I raided last time I went home. Here's a sampling. I love each and every tiny piece, and try to imagine where the rest of the bolt went and who wore it back in 1969. I'm trying to think of more ways to use these lovely little pieces. Any ideas? Check out this calendar at Craft Log. You have read this article with the title February 2007. You can bookmark this page URL http://jenkrebs.blogspot.com/2007/02/what-to-do-with-these.html. Thanks! How ironic. After just writing about how I don't have and don't want a cell phone, I bought one. I still don't want it, but it seems necessary for business reasons. The first week it sat on my desk. Off. I didn't take it anywhere. Two people had the number. I think maybe six people have it now. Baby steps. You have read this article with the title February 2007. You can bookmark this page URL http://jenkrebs.blogspot.com/2007/02/guys-i-caved.html. Thanks! 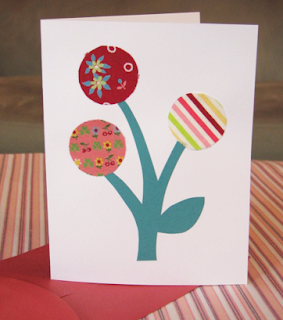 I made this (and the card version a couple posts ago) based on the easy instructions in the book Paper Flowers, checked out from my local library. This seems like a useful skill. And it's all just paper here. No wire, no glue. I bet it would be nice to decorate presents with them. You have read this article paper with the title February 2007. 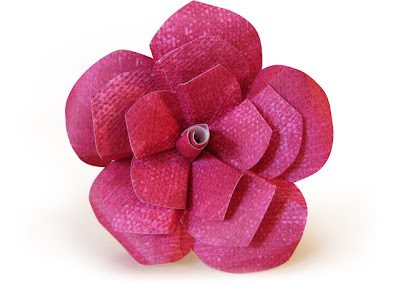 You can bookmark this page URL http://jenkrebs.blogspot.com/2007/02/paper-flowers.html. Thanks! Just in time for your fancy Valentine's Day dinner. I found this idea in a cookbook I have, and I think it's great. Here's my attempt (probably even nicer if you iron, but I'm too lazy). For an online tutorial with similar instructions, visit A Big Slice. You have read this article entertaining / tutorials / valentine's day with the title February 2007. 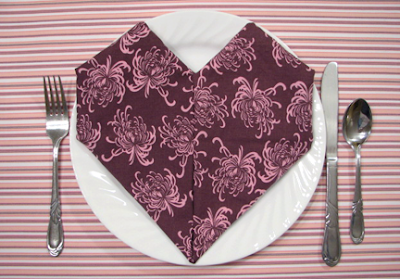 You can bookmark this page URL http://jenkrebs.blogspot.com/2007/02/fold-dinner-napkins-into-hearts.html. Thanks! Really complicated 3-D heart card from Some Assembly Required. They're not kidding. Good luck. 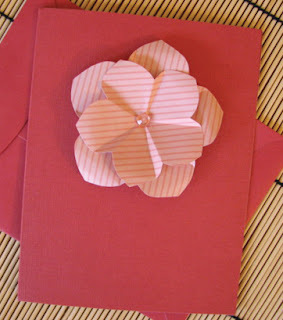 You have read this article tutorials / valentine's day with the title February 2007. 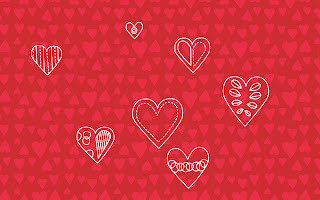 You can bookmark this page URL http://jenkrebs.blogspot.com/2007/02/valentine-day-project-ideas.html. Thanks! After we ate our fill at the tea party, we cleared the tables and made cards. I'm sad that my pictures of the "group shot" of everyone's cards didn't turn out. Not enough light by then, so they were very blurry. Here are mine, reshot at home. 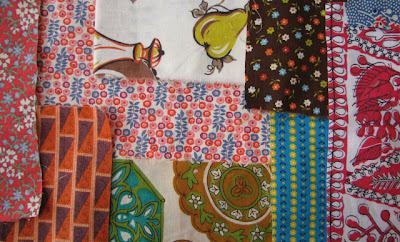 Megumi, recognize that fabric? You have read this article cards / paper / valentine's day with the title February 2007. 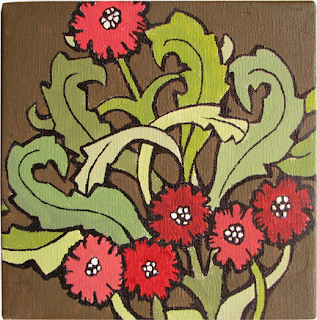 You can bookmark this page URL http://jenkrebs.blogspot.com/2007/02/part-two-cards.html. Thanks! Back from the tea party! I think it's our 6th annual, put together by Megan, Mandi and me. Every year we agonize over the invites, since Megan's apt. only holds so many. And we each know so many wonderful people. We're each allotted a handful of invitations, and we desperately hope we don't offend anyone we've left out. If we have, and you somehow happen to be reading this, we are SO VERY SORRY and hope you still like us. Anyway, here are pix of some of the food (two more card tables are in the other room.) I realize I took this before the scones appeared, so pretend you see maple scones in the empty bowl in the middle of the table. And I have to say, the chai-infused chocolate glaze on Megan's triple chocolate fudge cake was to die for. You have read this article entertaining / valentine's day with the title February 2007. You can bookmark this page URL http://jenkrebs.blogspot.com/2007/02/part-one-food.html. Thanks! I've got my fancy socks on, heading out the door to a Valentine Tea Party. Photos from the event to come! You have read this article valentine's day with the title February 2007. You can bookmark this page URL http://jenkrebs.blogspot.com/2007/02/ready-to-go.html. Thanks! I want to use these lovely girls (images from antique cigarette cards) for some kind of Valentine project. Just haven't had time to do something with them yet. Cut them out and glue them onto Valentine cards? String them with red ribbon to make a banner? Send them as postcards? Frame them in my bathroom? You can get these, and the whole set, here from the New York Public Library's digital archive. Keep hitting "next" to scroll through the cards. You have read this article valentine's day with the title February 2007. You can bookmark this page URL http://jenkrebs.blogspot.com/2007/02/beeyooteeful-ladies.html. Thanks! A wonderful package arrived last week from Megumi, containing fabric swatches, stickers, and a CD of inspirational photos from the Tokyo Quilt Festival. Here are some samples of the amazing craftsmanship and design seen there. You have read this article with the title February 2007. 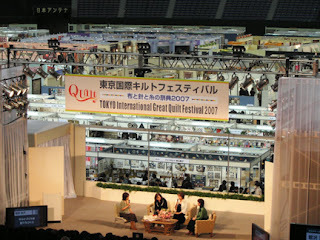 You can bookmark this page URL http://jenkrebs.blogspot.com/2007/02/tokyo-international-quilt-festival.html. Thanks! You have read this article time-wasters with the title February 2007. You can bookmark this page URL http://jenkrebs.blogspot.com/2007/02/your-visual-dna.html. Thanks! It's -2 degrees here right now (I know some of you guys have it worse!) and I'm getting seriously sick of winter. This $1.50 primrose from the grocery store is helping me cope. You have read this article favorite things with the title February 2007. You can bookmark this page URL http://jenkrebs.blogspot.com/2007/02/it-cold-outside.html. Thanks! Happy February! In honor of St. Valentine, I made you some wallpaper. 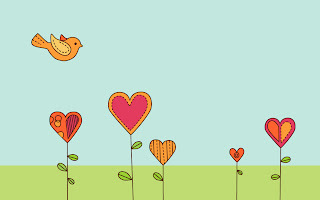 You have read this article desktops / downloads / valentine's day with the title February 2007. 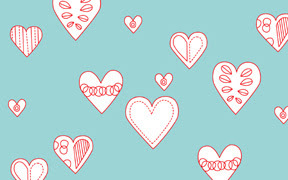 You can bookmark this page URL http://jenkrebs.blogspot.com/2007/02/download-valentine-wallpaper.html. Thanks!